As you know, since June I have been working my way through the collection of cookbooks that is scattered all over our house. I have rid myself of a few duds and have found some new favorites so I think the endeavor has been a success. That being said, I am taking this week (and maybe this month ) off from picking a cookbook and solely using it to plan my menu. Mainly because the freezers are at capacity and I need space for holiday baking and make-ahead meals so we will be eating from the freezers and pantry this week. For the raita dressing I nixed the cucumbers in the recipe since they were in the salad. It was light and refreshing and tasty. One of my favorite English cookbook authors is Ainsley Harriot. He had a show called Meals in Minutes and has built his reputation on making good food quickly. I used his korma recipe from the Meals in Minutes cookbook. I've used this book so often that the pages are stuck together. I had never made this korma before and everyone really liked it. This was rice that had dried fruit and almonds mixed in it from New Recipes for Your Slo-Cooker. 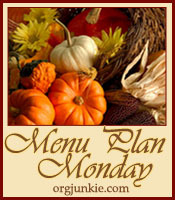 Again, this is part or Organizing Junkie's Menu Plan Monday.